Zachary Levi Pugh (born September 29, 1980), better known by his stage name Zachary Levi, is an American television actor, director, and singer known for the roles of Kipp Steadman in Less than Perfect, Chuck Bartowski in Chuck, and Flynn Rider in Tangled. Zachary Levi Pugh was born in Lake Charles, Louisiana, to Susy and Darrell Pugh.He is the middle child between two sisters, Sarah and Shekina… h.He is of Welsh ancestry. As a child, his family moved all over the country before making their final move to their new home in Ventura, California, where Levi attended Buena High School for four years. He began acting in theatre at the age of six, performing lead roles in regional productions such as Grease, The Outsiders, Oliver,The Wizard of Oz and Big River at the Simi Valley Cultural Arts Center. 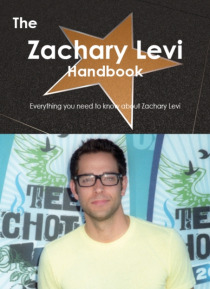 This book is your ultimate resource for Zachary Levi. Here you will find the most up-to-date information, photos, and much more. In easy to read chapters, with extensive references and links to get you to know all there is to know about his Early life, Career and Personal life right away. A quick look inside: Zachary Levi, Less than Perfect, See Jane Date, Big Momma's House 2, Spiral (2007 film), Chuck (TV series), Wieners (film), Shades of Ray, Alvin and the Chipmunks: The Squeakquel, Tangled.